In the six hundredth year of Noah's life, in the second month, the seventeenth day of the month, the same day were all the fountains of the great deep broken up, and the windows of heaven were opened. And the rain was upon the earth forty days and forty nights. In the selfsame day entered Noah, and Shem, and Ham, and Japheth, the sons of Noah, and Noah's wife, and the three wives of his sons with them, into the ark; They, and every beast after his kind, and all the cattle after their kind, and every creeping thing that creepeth upon the earth after his kind, and every fowl after his kind, every bird of every sort. And they went in unto Noah into the ark, two and two of all flesh, wherein is the breath of life. And they that went in, went in male and female of all flesh, as God had commanded him: and the Lord shut him in. And the flood was forty days upon the Earth; and the waters increased, and bare up the ark, and it was lift up above the earth. And the waters prevailed, and were increased greatly upon the earth; and the ark went upon the face of the waters. And the waters prevailed exceedingly upon the earth; and all the high hills, that were under the whole heaven, were covered. Fifteen [?] cubits upward did the waters prevail; and the mountains were covered. Biblical accounts of the epic scale of Noah's ark and the catastrophic proportions of The Great Flood have filled readers with awe for many, many generations. Details such as these boggle the rational mind, especially the extreme age of 600 years given for Noah, at the time of the Deluge. Simpler flood accounts have also been recovered from Sumerian libraries, on cuneiform tablet texts from Nineveh dating back 4,500 years. The present-day resting position of the ark is a several hundred meters below its original landing, and was known among ancient Mediterranean cultures as a significant historical site of worship. Romano-Jewish historian Josephus wrote that visitors to the mountaintop location customarily removed bitumen from the ark, to be kept as amulets and talismans. 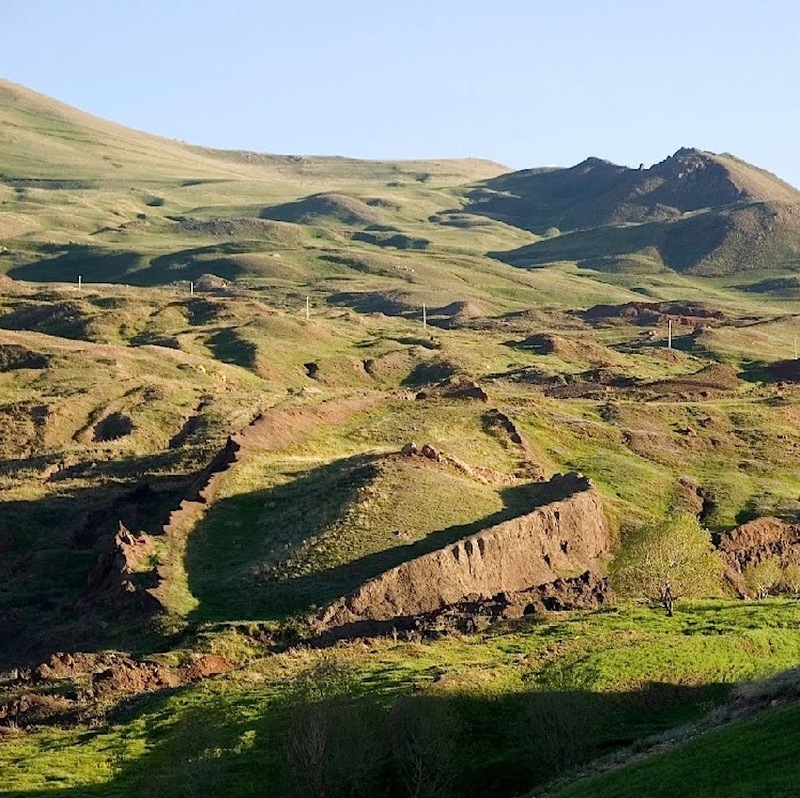 However, long before these Roman and Sumerian texts were authored, the ark had been shoved downslope from its original resting place by an ancient lava flow which impaled the vessel on a limestone ridge, leaving the ship's prow pointing uphill. A satellite image of the boat-like formation appeared in Life magazine in 1960, following an expedition that was later documented in a book called The Ark File (1974) by expedition member Rene Noorbergen. The ship's physical remains were subsequently confirmed as the ark of Noah by onsite surveys in 1977 and '79 by Ron Wyatt, an independent investigator who applied metal detectors and ground penetrating radar. Upon inspection of the ridges delineating the great ship, Wyatt could discern a regular pattern of rib timbers comprising the ark's hull, still visible as dark areas eroding out of the embankment. The first comprehensive scans of the ark formation were conducted by Wyatt in 1985 using handheld metal detectors, revealing a regular pattern of iron struts distributed latitudinally and longitudinally throughout the huge wooden hull. Measurements of the large structure revealed a total length of 515' or 1,680", corresponding to 300 Egyptian cubits (@ 20.6"/cubit), exactly matching the dimensions of Noah's ark stated in the Bible. The Egyptian cubit was inherited from the preceding high civilization of Atlantis, and Noah was an Atlantean. Noah's great age of 600 years at the time of the Deluge was resonantly enhanced through the roaring infrasound of the global network of Atlantean pyramids, endowing average human lifespans of ~900 years. Physical trace evidence of resonant atmospheric conditions induced by the pyramids was retrieved by Ron Wyatt in the form of petrified wood samples acquired with the permission of the Turkish government. 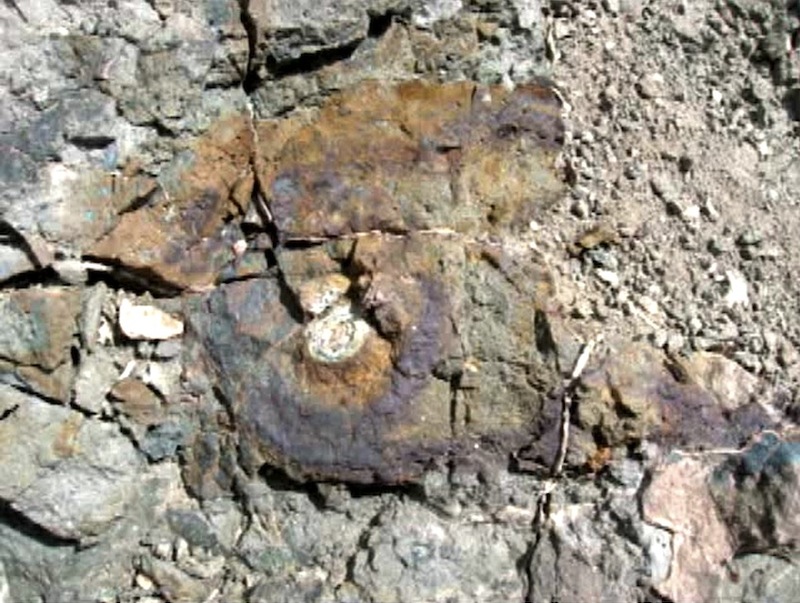 Several rust-colored rings of what appeared to be heavily corroded wrought iron rivets were identified by Wyatt in the exposed hull sections, apparently connected to long iron struts that once fastened the ship (above, below). Despite their nearly unrecognizable condition, lab analyses identify them as man-made alloys. Comprehensive radiocarbon dating analyses of the abundant fragments of petrified wood at the ark site bearing organic carbon have certainly been conducted by both Turkish and US government scientists at national laboratories, yet those results have not been publicly released --for the surprising actual age of the ark of Noah exceeds the dates provided in the Biblical account by over 25,000 years. It is widely accepted that wood petrification and bone fossilization processes usually occur over prolonged timescales requiring tens of thousands of years or more, being significantly dependant on the prevailing environmental conditions. The ark timbers' petrified condition implicates a minimum age of ~20,000 years. Q: In relation to the history of Atlantis as presented, at what period did the flood as recorded in the Bible in which Noah took part, occur? [T]he entity was in Atlantis when there was the second period of disturbance --which would be some twenty-two thousand, five hundred (22,500) [years] before the periods of the Egyptian activity covered by the Exodus; or it was some twenty-eight thousand (28,000) [years] before Christ, see? The compendium of over 14,000 Edgar Cayce readings also contains a Life Reading given on July 29, 1941 for the contemporary modern reincarnation of Noah himself (Reading 2547-1): "For, before that [incarnation] the entity was that one to whom was entrusted man's advent into the world --Noah." Before that [incarnation] we find the entity was in the land when there were those preparations that man would not be wholly destroyed but how that the Father-God warned Noah to build the ark and to gather his sons and their families. The entity was one born in the ark during those periods, for the wife of Japheth, the son of Noah, was heavy with child, and it was born during those periods in the ark. These synchronous information sets concerning the Great Flood were channeled by Edgar Cayce over an extended period of 12 years, and deserve careful reconsideration in light of the physical remains of Noah's ark that are just now beginning to reach the awareness of the general public, a full 7 decades after Cayce's passing. Many of the Sleeping Prophet's controversial claims have been vindicated by science. 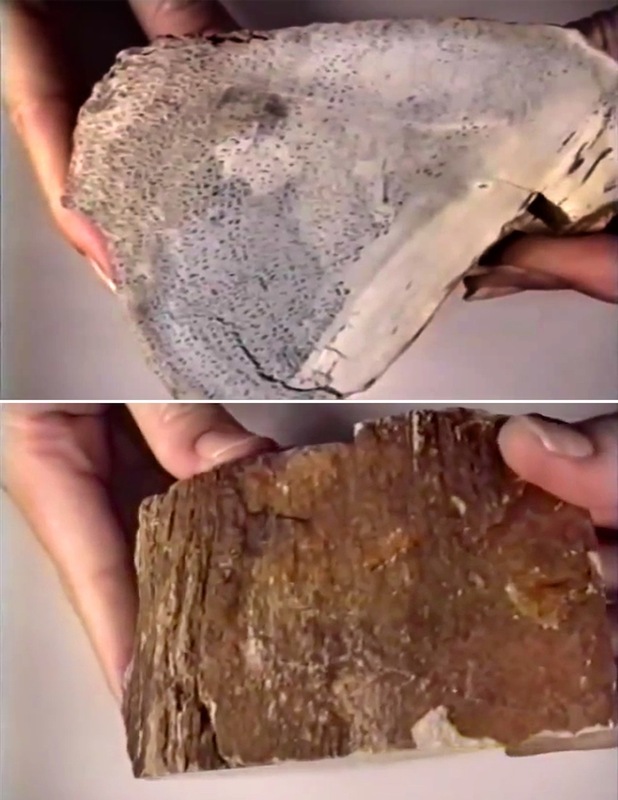 These surprising and long contested statements explain enigmatic tree-ring evidence presented by Ron Wyatt, who documented petrified wood samples collected from the ark that display no clearly discernable ring patterns, despite the nearly perfect preservation of pore structures throughout the samples (above). In 1987, Wyatt retrieved a section of deck timber sample that had been identified by ground penetrating radar scans at <1m below the soil surface. 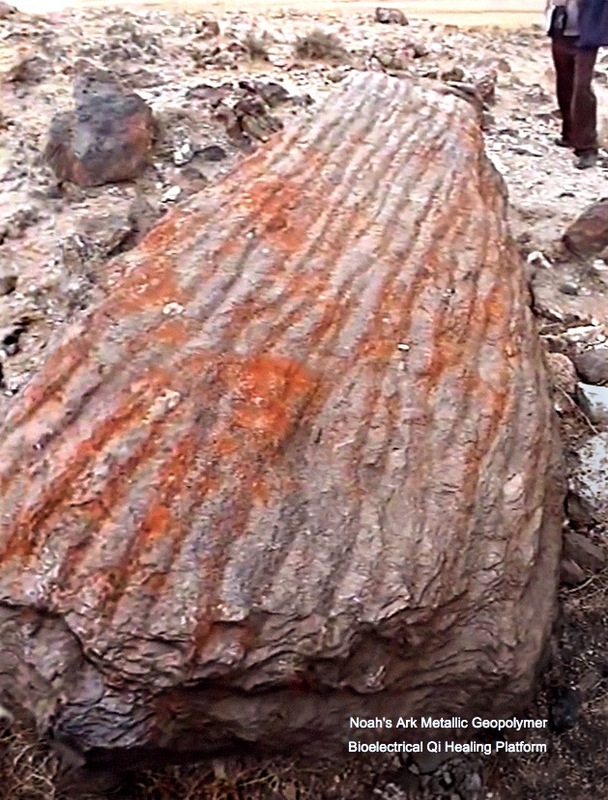 Cross-sections cut into the petrified deck timber sample during laboratory analyses revealed a 3-layer lamination using tree sap resin had been expertly accomplished by the skilled Atlantean ark builders (above). Noah's use of "gopher wood" (Genesis 6:14) actually refers to wood laminated with pitch, corresponding to the exact meaning of the Hebrew word 'kopher': "pitch". Wyatt had determined the ark's original landing position after spotting a wide swath of petrified wood and heavy slag rubble that proved to be metallic in character. 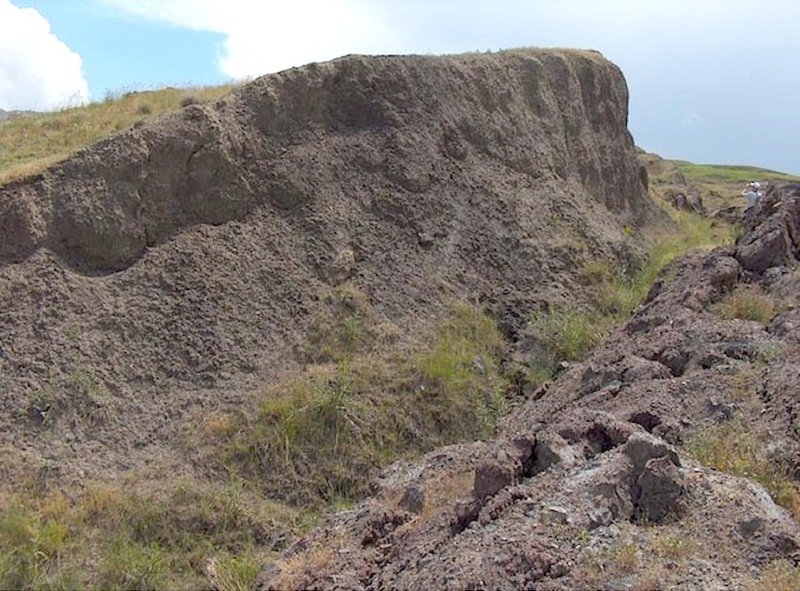 Laboratory examination of several heavy ore-like samples taken from this large rubble field located on the high ridge a few hundred meters above the ark revealed an unnatural elemental composition recognizable as waste slag from sophisticated iron alloying processes. Wyatt surmised that several tons of this high-density material had been placed in the lowest compartments of the ark to act as ballast, stabilizing the giant flood-worthy vessel (above). 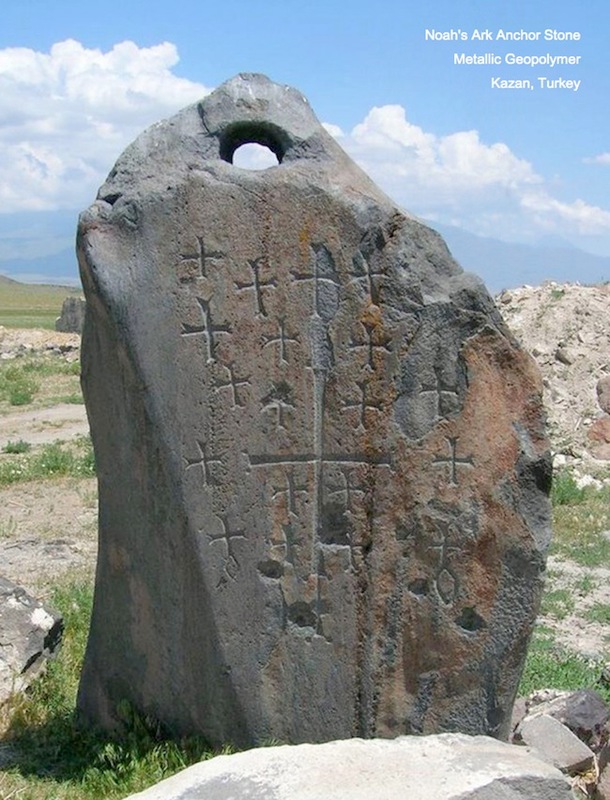 Numerous standing stones, each with a large circular hole at the top, were first identified as giant anchor stones by Ron Wyatt in 1977 in the village of Kazan, situated far below the ark site. Having found 13 giant anchors in all, Wyatt determined the megaliths were deployed on long ropes below the ark as 'drogue stones', effectively stabilizing the keelsons of the giant ark in turbulence. 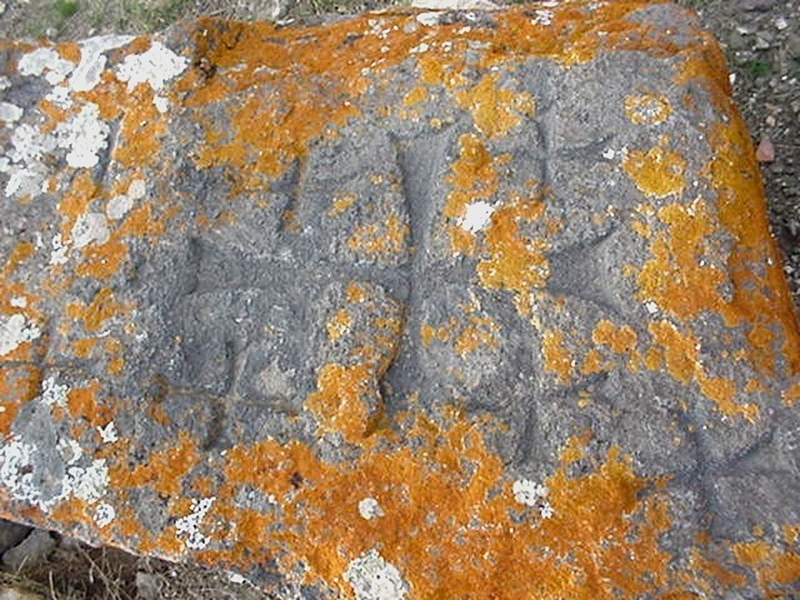 Sets of crosses were engraved into each of the immense anchor stones, with the exception of two partially interred examples, representing the eight members of Noah's family who were saved in the ark, and their progeny. The unusual forms, surface features and special composition of these megalithic anchors bear the many hallmarks of advanced geopolymer fabrication techniques developed by Atlantean engineers for producing strong and extremely heavy synthetic stones with remarkable acoustic and electromagnetic properties. Atlantean 'firestone' geopolymers were cast in heavy, clay-lined wooden molds from a liquid slurry of pulverized basalt and quartz, finely ground ferromagnetic metals, kaolin clay, fly ash and water. 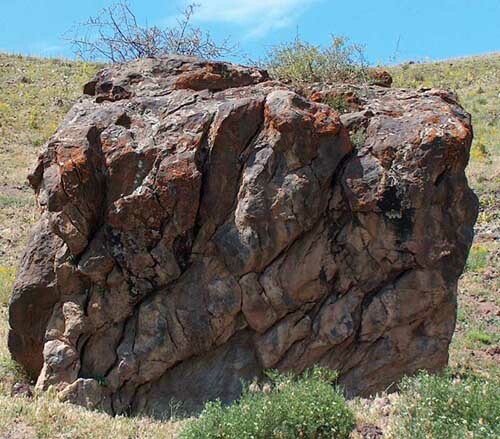 The megalithic anchors have been mischaracterized as locally quarried andesites, yet their strong magnetic properties and extremely high density deny any possibility of a natural origin. Micrographs of samples from the giant anchors reveal metal particles proving their synthetic origin as high-tech Atlantean geopolymers. The largest and best-preserved example of the ark's drogue stones was measured at an impressive 15' in height, while conservative estimates for its total weight exceed 10 tons (above). 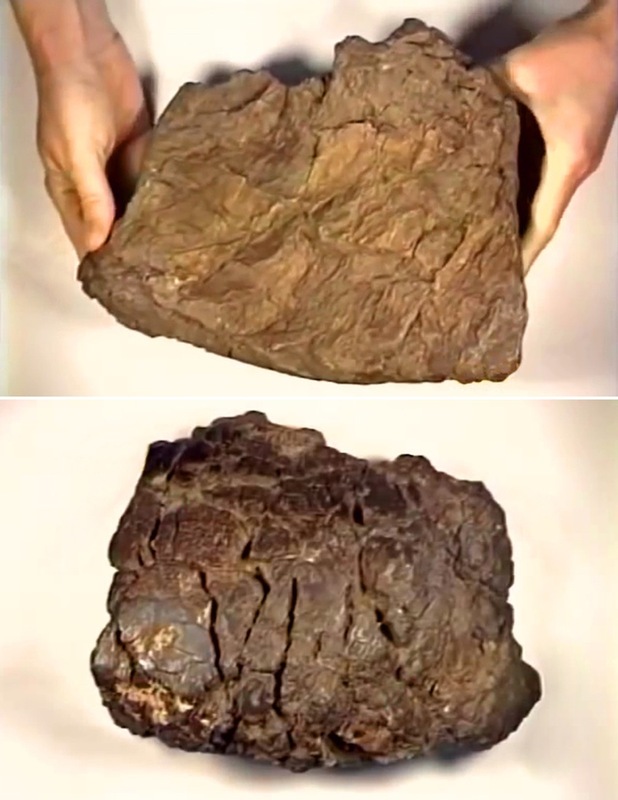 The synthetic megalith's original cast surfaces have been preserved on a large portion of the anchor, displaying the distinctive rusty hue of iron-rich kaolin clay that slowly migrated into the liquid slurry from the mold interface during a period of several hours required for the geopolymer mixture to cure to full hardness. 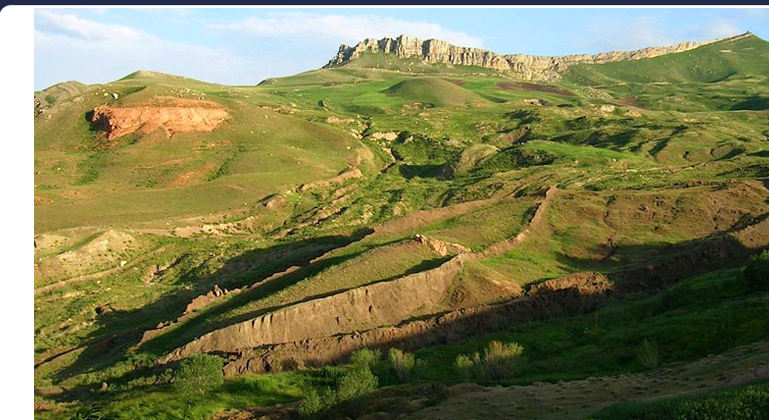 After speaking through translators with local villagers, Ron Wyatt also surveyed and obtained video footage of a special valley still referred to today as the 'Valley of the Eight'. Immediately surrounding the house of Noah are a network of low megalithic walls for animal husbandry that were once three times their present height, having accumulated nearly 30,000 years of soil. Located on a promontory high above Noah's stone house Wyatt discovered a giant altar in the form of a cube, roughly measuring 12' x 12' x 12', bearing deep erosive scars from extreme weathering conditions at high-altitude over a vast time period spanning nearly 30 millennia (below). The platform's rough geometric shaping and prominent location suggests it was an altar built by Noah, overlooking the 'Valley of the Eight'. In addition to the 13 giant drogue stones discovered thus far, another megalith was documented that stands apart from the others, and may have served a distinct purpose. The same clusters of crosses have been engraved into this strangely shaped megalith by Roman era visitors to the ark sites. This massive monolith gives the first impression of being a petrified wood fragment from a gigantic tree due to the bark-like corrugations covering its exposed skyward surface, yet the object is composed of stone (opposite). When struck with a stone, this corrugated megalith produces a loud, resonant metallic ringing that betrays a high metal content, confirming its synthetic origin as a textured geopolymer used as a giant gong platform for bioelectrical qi healing. 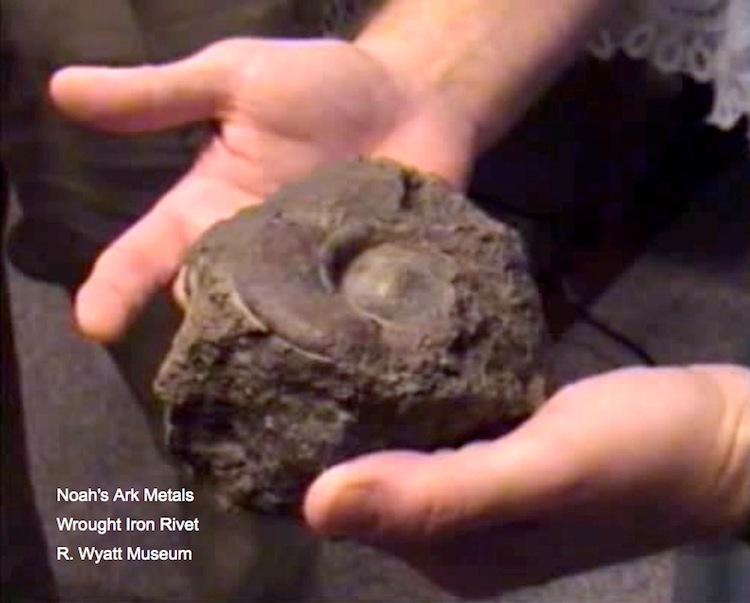 Cayce identified this type of artificial stone as Atlantean firestone. The presence of a massive Atlantean firestone healing platform on the ark of Noah, which would also have served for long distance communication by generating loud infrasound when rhythmically struck, provides another clear temporal indication perfectly aligned with an age of ~30,000 years. Cayce conducted Life Readings for the visionary inventor Nikola Tesla that detailed his prior incarnation as Ajax of Ode, Atlantean leader and Vedic scientist responsible for great technological advances made during that period. High technologies demand great responsibility, for their abuse invites total disaster. How high did global sea levels rise during the Deluge, and what could possibly cause such an event? The ark is presently resting at an altitude of ~1,966m, while the original resting place further up the mountain was situated at ~2,300m altitude. The Biblical account of the Great Flood event states that the surrounding mountain peaks completely submerged, as they were no longer visible to Noah during the period of the floodwaters greatest height. 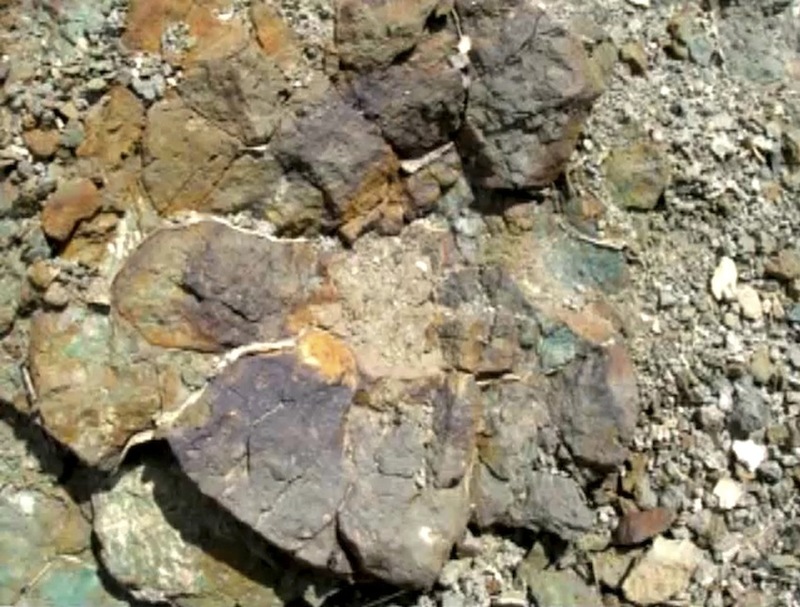 However, 30,000 years ago the summit of Mt. 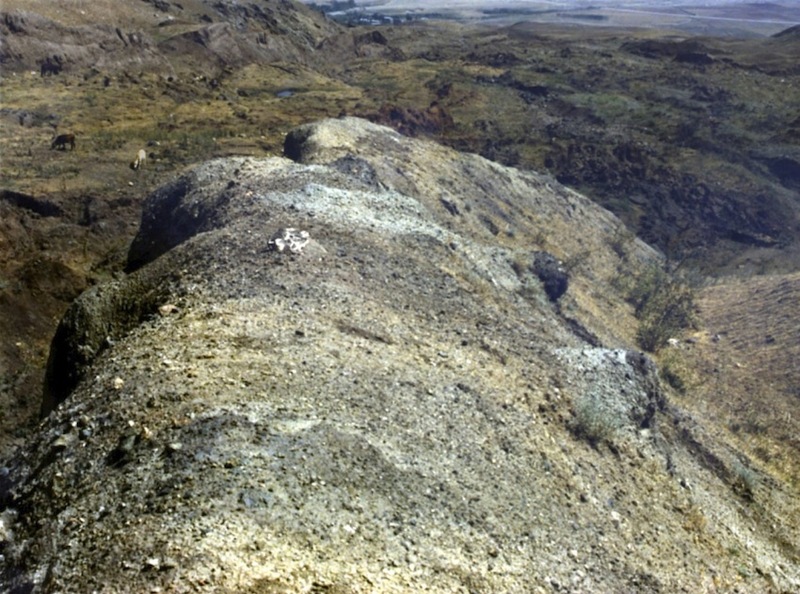 Ararat would most likely have been less prominent --perhaps as much as 2,000m lower than it is today (5,137m). Digital terrain models of Earth with sea levels elevated to an extreme altitude of 3,200m, according to present-day landforms, offer a striking visualization of our planet under Deluge (above). Only the Andes and the Himalayas remained as high-altitude refuges where terrestrial species survived the great calamity. In the active forces of these the entity brought destructive forces, by the setting up --in various portions of the land-- the character that was to act as producing the powers in the various forms of the people's activities in the cities, the towns, the countries surrounding same. These, not intentionally, were tuned too high --and brought the second period of destructive forces to the peoples in the land, and broke up the land into the isles that later became the periods when the further destructive forces were brought in the land. 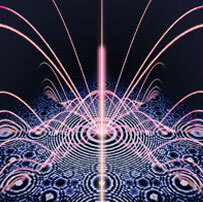 The advanced technological context of the causal circumstances explained in precise terms by Edgar Cayce offers a compelling explanation for such a catastrophic inundation, the likes of which had never been experienced before that time, nor since. Isotopic analyses of megafauna bones confirms mammoth populations were decimated 30,000 years ago, having repopulated Eurasia from the Tibetan plateau. A recent assessment of sea level change extending back tens of thousands of years based on the correlation of dated shoreline materials accommodates Cayce's Great Flood timeline perfectly (Lambeck et al., 2014). 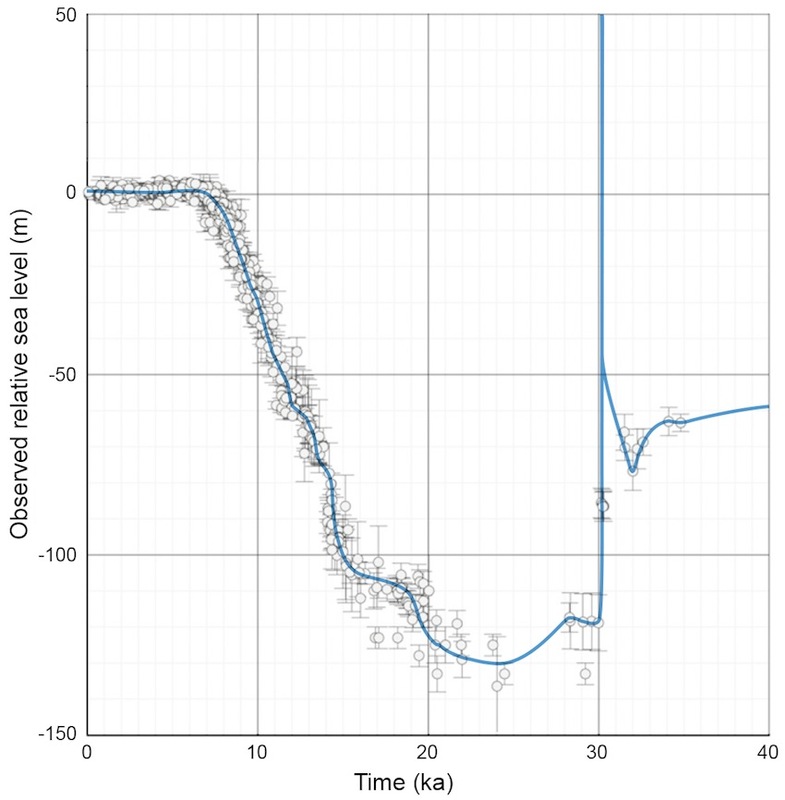 A blue line has been superimposed on the data to indicate general trends in sea level change over time that coincide beautifully with a sharp peak at 30,000bp, marking the epic Great Flood catastrophe as given by Cayce (above). 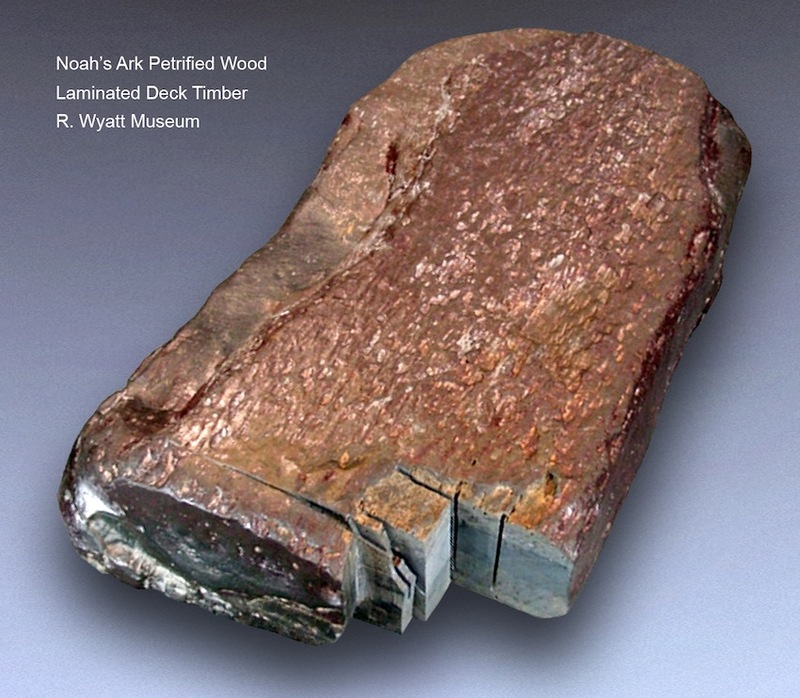 Dating of the petrified ark timbers constitutes irrefutable proof. Abundant physical remains in the form of high-tech metal alloys, slag ballast, the petrified wooden ark and metallic megaliths substantiate the statements of trance medium Edgar Cayce, attesting to the extremely advanced technological capabilities of the Atlantean ark-builder Noah. His great works endure today as somber monuments warning of the destructive force of human negligence, and the recurring technological abuses of declining civilizations that have brought Earthly humanity to the brink of extinction many times.